This Altar Scarf features the Chi-Rho Cross and accent fabrics of white, orange, and gold. 20” wide x 42” long including 24” front drop. This is part of a custom designed matched set made from Cathedral material, a linen-textured fabric. Bold multicolor symbols are combined with complementing accent fabrics to create a sweeping affect on each piece. Please allow 6-8 weeks for delivery, when not in stock. To check stock availability, please contact us at 1-800-672-1789. 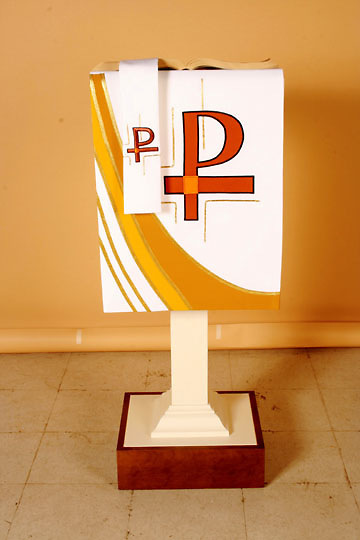 All of the Ascension Series pieces can be made to custom fit your chancel area. For help with placing a custom order, please call and ask for the Custom Sales Department. The Chi Rho is one of the earliest cruciform symbols used by Christians. It is formed by superimposing the first two letters of the word "Christ" in Greek. The Chi Rho invokes the crucifixion of Jesus as well as symbolizing his status as the Christ. The earliest evidence of the Chi Rho symbol is Constantine's use of it on the labarum, the imperial standard, in the early 4th century CE. Lactantius, a 4th century Christian apologist, reports that on the eve of the Battle of the Milvian Bridge in 312 CE, Constantine had a vision of God in which he was commanded to mark his men's shields with the Chi Rho symbol. After Constantine's success at the Milvian bridge, the Chi Rho became the official imperial insignia. Archaeologists have uncovered evidence demonstrating that the Chi Rho was emblazoned on the helmet and shield of Constantine as well as those of all of his soldiers. Coins and medallions minted during Constantine's reign also bore the Chi Rho.